Discovered and coined by Phil Gordon, the Gordon Pair Principle is a shortcut that can be used when you're holding a pocket pair to find out the probability that another player at the table holds a bigger pocket pair than you. What is the Gordon Pair Principle? The Gordon Pair Principle is a quick and easy method for working out the percentage chance that an opponent acting after you has a higher pocket pair than you. So for example, if you have 6-6 on the button, what are the chances that the SB or the BB have a higher pocket pair? The Gordon Pair Principle will help you to quickly work it out. The results aren't exact, but they're close enough to make it a useful shortcut. To work out the percentage chance of an opponent acting after you holding a higher pair than you, simply multiply the number of players left to act by the number of higher pocket pairs, then divide by 2. C = Percentage chance that an opponent left to act has a higher pocket pair. N = Number of players left to act after you. R = Number of higher pocket pairs than yours. The Gordon Pair Principle equation. Note: The GPP works out the percentage probability given that the cards have just been dealt and that no actions have taken place. Let's say that you are dealt pocket kings UTG in the first hand of a big MTT. There are 9 players at the table in total, which means that there are 8 players left to act after you. What are the chances that any one of these players is holding a bigger pocket pair than you (i.e. pocket aces)? You are dealt J-J on the button in a 6max cash game and the action folds around to you. What are the chances of either player in the blinds holding Q-Q, K-K or A-A? Your are dealt 6-6 on the button in FR cash game. UTG raises and a player in MP moves all in. What are the chances that either of the 2 players left behind you holds a higher pocket pair? You can't reliably use the Gordon Pair Principle in this situation. To be able to use the Gordon Pair Principle, you should ideally be the first to “act”. If there are a number of players raising and calling before you, it skews the distribution of hands that the players at the table could hold. If all the players acting before you fold however, the results of the GPP will remain fairly reliable. Gordon Pair Principle results table. Pair Number of players left to act. How can you use the Gordon Pair Principle? As handy as the Gordon Pair Principle might seem, the results are more interesting than practical. 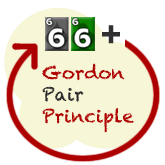 There are not a great deal of situations that will benefit from use of the Gordon Pair Principle. It's not like the rule of 4 and 2 where you can use the results to help you make more profitable decisions on the fly. For example, if you are dealt J-J on the button in the middle of an MTT with only 4 big blinds left in your stack, knowing that the probability of either of the two remaining players holds a pocket pair is 3% isn't going to influence your decision on whether or not to shove (shoving is obviously the best play). It's cool to know, but it's not a deal-breaker. Nonetheless, you may find it useful to be able to work out odds like this to prove a point or in conjunction with some other calculations when doing post-session analysis. Phil Gordon is a very tall professional poker player. He won a WPT title in 2004 and has commentated on a number of poker TV shows. He wrote the popular Little Green Book, which is an excellent collection of strategy tips for beginner/intermediate Texas Hold'em poker players. He also coined the handy rule of 4 and 2 (mentioned just moments ago) for working out pot odds on the fly. As ever, for more information on Mr. Gordon, check out the Phil Gordon wiki. Go back to the poker odds charts.